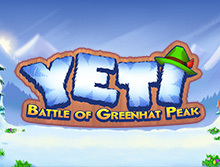 The cold winter season here, and there is no better way to enjoy than with Yeti Battle of Greenhat Peak slot. The slot was released in May 2018 by the leading developing company, Thunderkick. It has an attractive cartoonish theme, and you will get the chance to go on adventure side by side with either a Green hated man or Yeti as you search for treasures. Will manage to discover the hideout of Abominable SNowman? Yeti's cave was found by a mustached man in the Himalayas, and now he wants to revenge back in this slot with five reels, three rows and 11 possible ways to win. There are numerous symbols and unique features like free spins, bonus game, a bonus symbol,, sticky wilds and many other to increase your chances of landing the highest prize. Besides the different features, Yeti has the theoretical return to player of 96.1% and a betting rage of between $.10 up to $100. Play this amazing video slot on smartphones and tablets powered by Android and iOS. The land of Greenhat Peak as portrayed in Thunderkick's slot is mostly cartoonish and very attractive. The reels in the slot are set against a small snowy hill and with Yet's house standing on the left side. There is a beautiful sign for bidding the green hats on the side right of the screen. The colors are fantastic and blend perfectly with the theme of the game. You will enjoy smooth gameplay with stunning graphics and visual animations across all devices including mobiles and desktops. Also, you will be entertained by an excellent soundtrack in the background as you search for the highest rewarding symbol. If you have played Thunderkick slot games before, then you understand the different rules and format they use. 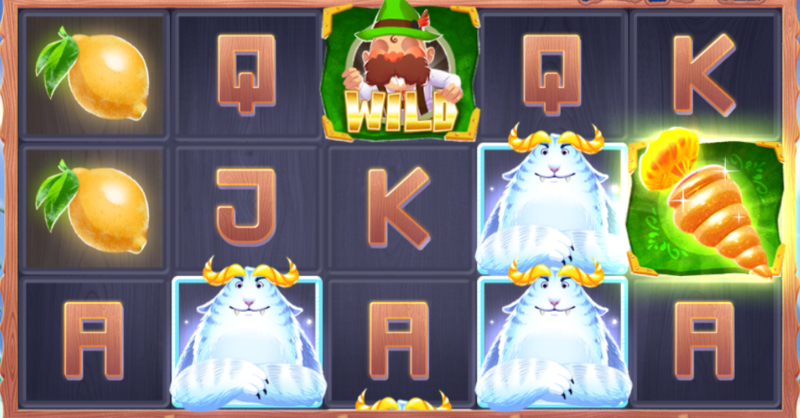 Yeti Battle of Greenhat Peak slot is not any different. There is a general layout of 5 reels, three rows and 11 pay lines that award from the left to the right reel. As you expect, the minimum symbols for activating a winning combination is three, and you can bet from as little as $0.10 to a $100 per spin. The wide betting range accommodates players with all budgets from low roller to high rollers. The spin button is located in the bottom right corner of the screen while the Autoplay button is next to it. This button will allow you to set up to 5000 spins to run uninterruptedly. The moment the game loads, you will see the two main characters of the game; the mustache man is the Wild symbol and can replace for all another symbol. The wild can also be a Frozen Sticky Wild but not during the base game. Yeti himself is the highest paying regular symbol. Keep your eyes on the Golden carrot which is also the Scatter symbol of the game as it can activate both the Wild Attack and Free Spins. You will also find a wide variety of fruits on the table including the cherries, lemons, watermelon, and traditional playing card symbols marked J through A. The wild symbol replaces for all other symbols in the game except the Bonus symbol. Land two or more Bonus symbols anywhere on the reels to unlock the Wild Attack feature. Three or more Bonus symbols appearing anywhere on the reels will activate the Bonus Game. Additional Bonus symbols after three will pay an extra five free spins each for a maximum total of 20. The initial number of spins awarded depends on the number of triggering the Bonus symbol. Each Bonus symbol that appears on the reels activates one step on the Wild Attack meter. Every three Bonus symbols award an extra random Sticky Wild for the remainder of the Bonus Game, and rewards five additional free spins. The maximum amount of free spins in the Bonus Game is 31. ANy wild landing on the reels during the Bonus Game will lock in place for the rest of the bonus round or until it is included ina winning pay line. Two scatter symbols will activate the Wild Attack respin with an additional 1-3 Sticky Wild symbols on the Bonus Game consisting of 10. When the Wild Attack is enabled, any wild not showcasing on a winning pay line will become a Sticky Wild. The Sticky Wild symbols occur during the Wild Attack feature and can happen during the Bonus Game. Thundekick's Yeti video slot gives you a chance to enjoy on the go via smartphones and tablets from anywhere around the world. It is created with cutting edge technology such as HTML5 which enables it to run smoothly on small screen devices. The graphics and animations are stunning as well as the soundtrack that will keep you immersed in the game for many hours. Play Yeti Bettle of Greenhat Peak slot instantly through browsers like Firefox, Chrome, and Safri at bCasino and win incredible prizes. Are you looking for a reputable UK based online casino where you can play Yeti slot and win real money? Well, bCasino is the best site to try. We are a newly established online casino site operating in Europe and across the world. , and all our customer's sensitive details are protected by 128-bit Secure Socket Layer encryption technology. Our games are unique and supplied by some of the best know software developers in the industry like NetEnt and Evolution Gaming. One of the reasons why most players opt for our site is the generous welcome bonus of up to $1200 plus free spins. All our customer support agents are highly trained and experienced. You can contact them anytime through email, live chat, and telephone.